On the policy panel at the Ohio Farm to Cafeteria Pre-Conference, April 25, (left to right): Joe Brown, Columbus City Schools; Tony Staubach, 4-H Agri-Science in the City; and Alice Chalmers, Ohio Valley Food Connection. CINCINNATI — Providing local food from farms to schools and teaching students about agriculture has its challenges, including education, resources and time, according to attendees at the Ohio Farm to Cafeteria Pre-Conference. The Ohio Farm to Cafeteria Pre-Conference hosted people who participate or are interested in farm to school programs, April 25, at the Duke Energy Center in Cincinnati. Farm to school programs vary by location, but generally they include procurement of local foods, education and school gardens. Brian Snyder, executive director of InFACT (Initiative for Food and AgriCultural Transformation), spoke at the conference about his findings from working with medium and large cities throughout Ohio. During his visits to various cities, he has identified a common theme: the center of cities are hollowing out in terms of economic activity. He said that this includes “hundreds and hundreds” of vacant business and residential spaces. “How can we bring agriculture into the middle of the cities and use that to help revive the well being of our cities?” said Snyder, explaining that many people in these areas are thinking about these ideas. 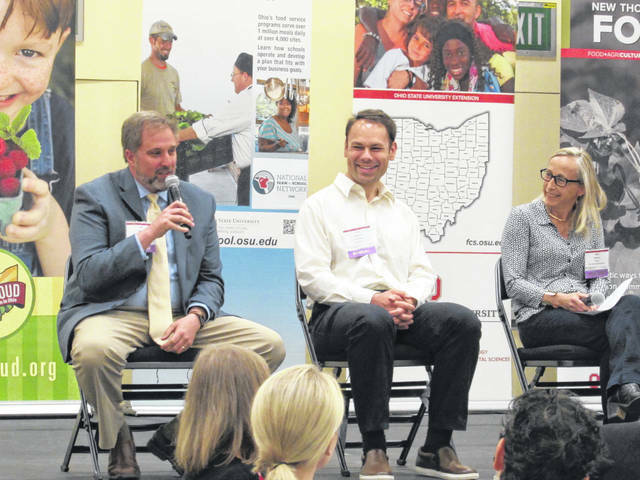 The Ohio Pre-Conference provided attendees with a panel and forum to discuss and learn about challenges, successes and significant issues regarding providing fresh food from farms to schools. Education and resources were two common topics discussed throughout the panel. Panel moderator Carol Smathers, director of Ohio Farm to School Program, said that the intent of the panel was to discuss what types of policies could be implemented in relation to the three C’s: community, cafeteria and classroom. On the panel, Tony Staubach, Ohio State Extension Educator, 4-H Agri-Science in the City, emphasized the significant impact that exposing young students to food has on their view on food. Staubach has found that many teachers do not know much about food and so he would like to see education provided to teachers. Many schools use gardens to teach students about growing food. He added that he would like to see schools “operationalize” gardens. However, there are strict regulations for serving the food grown on a school garden, and so they are used for learning tools for students and even teachers. Also on the panel were Joe Brown, Food Service Director, Columbus City Schools and Alice Chalmers, Founder, Ohio Valley Food Connection. Brown admitted that one of his largest challenges is purchasing as a government entity. “Ultimately at the end of the day, I need to make sure we follow all of our government rules, all our district rules and all the USDA (United States Department of Agriculture) rules,” Brown said. He said that sometimes this means bidding out to a location that is cheaper. “We want to support the person right up the road, but based on regulations and requirements, we have to take the one that’s a lower price,” Brown said. Brown said that two-thirds of his school kitchens are not full kitchens. He has faced struggles with receiving food in usable forms without a full kitchen. Chalmers said that Ohio can look to its southern neighbor as a model for implementing effective farm to school policies and programs. The Ohio Valley Food Connection is located in Cincinnati, near the Kentucky border. “Let’s look to Kentucky for some really good examples of policies that work for schools,” Chalmers said. She said that Kentucky has a rewards program where schools can receive 10 percent back of all spending on local foods from local farmers up to a certain level. “Talk about an incentive that basically reduces your cost by 10 percent,” Chalmers said. She also talked about a program, which she said is the first in the country, the Kentucky Summer Food Program, which provides schools who purchase from local farms one-third of that cost back. Chalmers said that the work they do at the Ohio Valley Food Connection is “very much a customized process.” She added that they could provide education on seasonality, explaining that products are available year round. She said that their day-to-day job at the Ohio Valley Food Connection is to provide education and customization. “Working with the farms to actually bring it together…often times one supplier will not be sufficient to supply a school district. I will need to get kale from three or four farmers. That’s the value we provide — is to make that coordination happen,” Chalmers said. The Ohio Pre-Conference attendees also participated in a group discussion forum. Each group decided on a topic to discuss and wrote down challenges and action items. One person from each group then shared during a 1-minute lightning round. Some challenges generated from this forum were: collaboration; resources; competition with USDA commodity prices; size of school districts; education; time; managing expectations between farmer and schools; and value of local farmers. For more information about the National Farm to School Network, visit: www.farmtoschool.org. https://www.rurallifetoday.com/wp-content/uploads/sites/56/2018/05/web1_FarmtoCafeteria.jpgOn the policy panel at the Ohio Farm to Cafeteria Pre-Conference, April 25, (left to right): Joe Brown, Columbus City Schools; Tony Staubach, 4-H Agri-Science in the City; and Alice Chalmers, Ohio Valley Food Connection.